The Boys & Girls Clubs of Thunder Bay now offer birthday party rentals as well as gym rentals for sports groups or special events. We currently offer four time-slots on both Saturday and Sunday, at 11:00 AM, 1:30 PM, 4:00 PM and 6:30 PM. 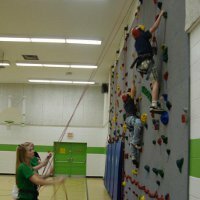 A typical birthday party includes rental of the gym for 2 hours with one inflatable, set up and supervision of inflatable(s) and/or climbing wall for up to 25 kids. Included in your rental is use of tables and chairs, use of any sporting equipment, kitchen access for storage and or cooking and clean up after the event. Please note; the Boys & Girls Club does not do off-site birthday parties. All parties are done at the Windsor St location. Click here for the availability calendar. This is updated each week! Great for children 10 and over (there is a 4' height requirement). Inside the inflatable arena are four raised pedestals for the competing jousters. Players must balance themselves atop while jousting and sparring to overcome up to three other opponents! Almost 60' of fun! Make your way through eight different obstacles, climb the steps to the 12' high peak and slide your way to the exit. Great for kids of all ages - the safest slide in the city! Our climbing wall comes in at 16 feet high by 32 feet wide. It has 5 separate lanes with 3 courses per lane for 15 different climbs from rookie to expert. Our newest inflatable is a traditional bouncer measuring 16 by 19 feet. Toss the balls through the hoop while bouncing away. The exit is a super fast slide. This one is recommended for the younger kids but is still good for all ages. 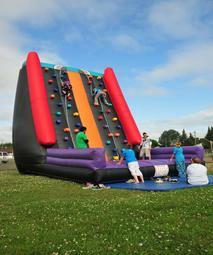 Check out our 26' high outdoor climbing wall! Available for outdoor events on or off site, we have everything you need to make your next large event a great success! Please call for details at 623-0354 ext 155. Sporting Equipment, TV with DVD player, or Kitchen Access: No charge, but please ask at time of booking! Please note that as a result of the 2018 minimum wage increase, the price of a basic party has increased to $250.00 effective Jan 3, 2018. We recommend that you book at least two months in advance - we fill up FAST! For your convenience, you can download the Rental information & Booking form right here. For more information on rentals including parties, please leave a message on our birthday party voice mailbox at (807) 623-0354 ext. 155, or email us at bgcadmin@tbaytel.net. The office is open 8:30am - 4pm Monday to Friday. All calls and emails will be returned in the order they are received. Standard Fee - $250. This fee includes rental of the gym for 2 hours, the set up and use of one inflatable (if applicable), set up and use of tables and chairs, supervision of party participants on inflatable or climbing wall and post-event clean up. FULL PAYMENT is required at the time of booking. Dates and times may be rescheduled at the discretion of the Boys & Girls Clubs of Thunder Bay. Any changes or additions to your original party booking must be requested at least two weeks prior to your party date. Want some food with your fun!